The Court of Appeal yesterday issued an Interim Order suspending the operation of the Gazette Notification dated February 17, 2017 on the Delimitation Committee Report, until December 4. The Court made this order consequent to a writ petition filed by six electors who challenged the legality of the Gazette Notification issued by the Provincial Councils and Local Government Minister on the Delimitation Committee Report with regard to the boundaries in respect of Local Authorities. The Court of Appeal’s three - judge - Bench comprising Justice L.T.B. Dehideniya, Justice Kumuduni Wickremesinghe and Justice Shiran Gunaratne observed that in promulgating the Gazette notification, the Local Government Minister has acted ultra vires the powers vested in him under section 3D of the Local Authorities Elections Ordinance. The Court further held that if any electoral process commenced in terms of the concerned gazette notification, irreparable damage would be caused to the people’s franchise rights. The Court also issued notices on the respondents to appear in Court on December 4. Several parties including United National Party (UNP), Janatha Vimukthi Peramuna (JVP) and Sri Lanka Podujana Peramuna (SLPP), Sri Lanka Freedom Party (SLFP) and PAFFREL organization have sought Court’s permission to intervene into the matter as intervenient petitioners. Six electors representing several Local Government institutions have filed a writ petition in the Court of Appeal challenging the legality of a Gazette Notification bearing No.2006/44 dated February 17, 2017 ammending the boundaries, number of members and the constituents in respect of Local Authorities. On a previous occasion, Deputy Solicitor General Arjuna Obeysekere appearing on behalf of Provincial Councils and Local Government Minister Faiszer Musthapha raised preliminary objections against the writ petition urging the Court to dismiss it in limine. He argued that the subject matter of this petition cannot be heard in the Court of Appeal, owing to lack of jurisdiction and stated that this matter should be referred to the Supreme Court, acting in terms of Article 125 of the Constitution. DSG Obeysekara further said the petitioners have challenged the franchise rights of the people delaying to hold the local government election. This petition had been filed by six electors representing the Colombo Municipal Council, Kandy Municipal Council, Panduwasnuwara Pradeshiya Sabha, Hali-Ela Pradeshiya Sabha and the Embilipitiya Pradeshiya Sabha. The petitioners cited Provincial Councils and Local Government Minister Faiszer Musthapha, Provincial Councils and Local Government Ministry Secretary, as respondents. The petitioners stated that a National Delimitation Committee has been established with a mandate to make recommendations to the Local Government Minister for the division of local authority areas to the wards and to determine the boundaries of each ward and assign a name and number of each such ward. The petitioners stated that if any electoral process commenced in terms of the Gazette notification which has been promulgated by the Minister ultra vires the powers vested on him in terms of Section 3D of Local Authorities Election Ordinance, irreparable loss and damage would be caused to the petitioners. 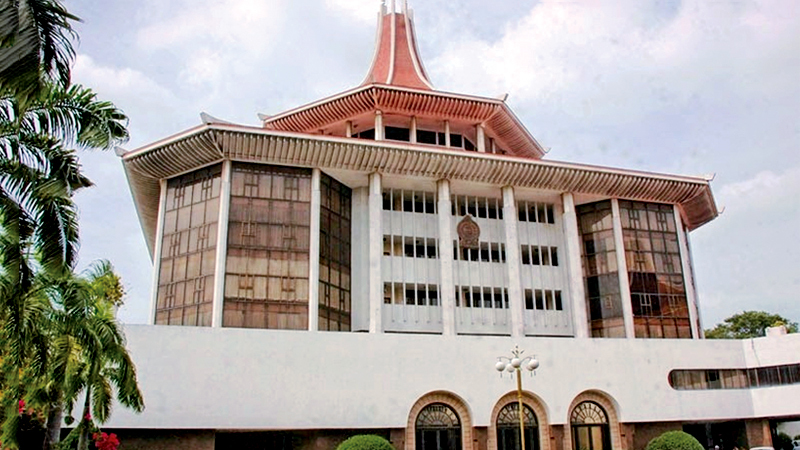 The petitioners stated that several wards in the Colombo Municipal Council which were designed as multi-member wards have been re-designed as wards which only elect one member to the council. The petitioners stated that in promulgating the Gazette Notification, the Minister of Local Government has acted ultra vires the powers vested in him under section 3D of the Local Authorities Elections Ordinance. Senior Counsel N.M. Shaheed appeared for the petitioners. Counsel Yasas de Silva appeared for UNP. Counsel Chamara Nanayakkarawasam with Sunil Watagala appeared for the JVP. Counsel Chrishmal Warnasuriya with Manjula Balasuriya appeared for the PAFFREL organisaion.